Election Tracker LIVE Updates: NCP leader Ajit Pawar has slammed Shiv Sena chief Uddhav Thackeray who was present when BJP chief Amit Shah filed his nomination in Gandhinagar earlier in the day. Pawar also accused the Sena of seeking votes in the name of Chhatrapati Shivaji, calling it “an insult to the warrior king’s glorious legacy”. CPI(M) General Secretary Sitaram Yechury on Saturday criticised the Election Commission's decision to give Narendra Modi a clean chit after the prime minister announced the successful anti-satellite test programme in a televised speech on March 27. Yechury, along with the Opposition parties, had accused Modi of violating the model code of conduct ahead of the upcoming elections. The senior CPI(M) leader claimed that the poll panel had taken a "narrow interpretation" of his complaint. Three Leaders Join Delhi BJP | Three leaders, including one from the Congress, joined the Delhi unit of the BJP Saturday. Balbir Singh from the Congress, President of Uttrakhand Pravasiye Sangh Delhi Rakesh Singh Rawat and Pramod Sachdeva, who had contested assembly elections on a BSP ticket, joined the BJP, the saffron party said in a release. Delhi BJP chief Manoj Tiwari said, "I am happy that the trust of the people is increasing in the BJP due to the influence of the policy of 'Sabka Saath Sabka Vikas' by Prime Minister Narendra Modi." Senior BSP Leader M Singh Phalianwala Joins Congress | Senior BSP leader and two-time Member of Parliament Mohan Singh Phalianwala Saturday joined the Congress in the presence of Chief Minister Amarinder Singh. Amarinder, in a statement, said Phalianwala would fortify the party's position in the Malwa region, which would help the Congress achieve its 'Mission 13'. "We will win all 13 seats with thumping margins," Amarinder asserted, while exhorting Phalianwala to mobilise his supporters towards the party's cause. Senior BSP Leader MS Phalianwala Joins Congress | Senior BSP leader and two-time Member of Parliament Mohan Singh Phalianwala Saturday joined the Congress in the presence of Chief Minister Amarinder Singh. Amarinder, in a statement, said Phalianwala would fortify the party's position in the Malwa region, which would help the Congress achieve its 'Mission 13'. "We will win all 13 seats with thumping margins," Amarinder asserted, while exhorting Phalianwala to mobilise his supporters towards the party's cause. Senior leader from Kotdwar Dhirendra Chauhan, who had quit the BJP during civic body polls in the state, rejoined the party on Saturday along with his supporters. Welcoming him back into the party fold, Uttrakhand Chief Minister Trivendra Singh Rawat said his return would further bolster the BJP's chances in Pauri. CPI-M Lodges Model Code of Conduct Violation Complaint Against CM | Opposition CPI-M Saturday lodged a complaint against Chief Minister Biplab Kumar Dev with the Election Commission for violating model code of conduct by allegedly luring voters with government jobs. We were shocked to see that the Chief Minister Deb is inciting violence and luring voters by offering government jobs before the Parliament elections. We have lodged a complaint with the Election Commission today, CPI-M West Tripura secretary Pabitra Kar told reporters. The Congress and CPI (M) leaders, including the Lok Sabha candidates, are under attack from BJP goons, he alleged. I'm a Chowkidar by Birth, says Sena's south Mumbai MP | The Shiv Sena's Mumbai South Lok Sabha MP Arvind Sawant Saturday hopped onto ally BJP's 'chowkidar' campaign by claiming his party since inception had the "essence" of the watchman, that of being vigilant and providing security. "Everyone who is alert and provides security is a chowkidar, including Shiv Sainiks. I am a chowkidar by birth and have been supporting the campaign since the two parties have been in alliance," Sawant said at the state BJP office. JMM petitions CEO against VC's 'chowkidar' remarks | The Jharkhand Mukti Morcha petitioned before the state Chief Electoral Officer L Khiangte to probe into alleged remarks made by Ranchi University Vice-Chancellor Ramesh Pandey, alluding to chowkidar. During his speech at the Ranchi University’s Convocation ceremony on Friday, Vice-Chancellor Ramesh Pandey called upon the students to become honest chowkidar', said the JMMs complaint letter to the CEO, a copy of which was released to the press. The letter urged the CEO to look into the video of the convocation ceremony and lodge violation of Model Code of Conduct case against the vice-chancellor as referring to any words of any particular political party was improper. JD-U vice-president Prashant Kishor tweeted on the political campaign song of YS Jaganmohan Reddy that crossed 10 million views on Youtube and said, "YS Jaganmohan Reddy, brother, before people of AP bless you to become their CM, they have already made you the rockstar!" Cong Fulfilling Gandhiji's Dream of Disbandment: BJP Leader Mungantiwar | Senior BJP leader Sudhir Mungantiwar on Saturday said the Congress, with its criticism of Prime Minister Narendra Modi, was fulfilling Mahatma Gandhi's wish that the opposition party be disbanded. He said the Congress had coined terms like "maut ka saudagar". "khoon ka dalal" for the PM and also said made casteist slurs. Speaking to reporters at the state BJP office, Mungantiwar, also Maharashtra finance minister, said, "Mahatma Gandhi was of the firm view that the Congress was meant only to attain freedom and not for power (and hence should be disbanded post Independence)." Delhi Cong Complaints to Delhi CEO Against Kejriwal | The Delhi unit of the Congress Saturday complained with the Chief Electoral Officer (CEO)against Chief Minister and AAP convener Arvind Kejriwal, accusing him of misusing his office by sending letters to voters and violating the poll code. A delegation of the Legal department of the Delhi congress led by its chairman Sunil Kumar submitted its complaint with the CEO (Delhi) seeking action against Kejriwal. "Chief Minister Arvind Kejriwal has grossly violated the code of conduct by misusing his official position by sending letters to lakhs of voters in Delhi," the delegation complained. TMC Launches Web Series 'Pradhan Mantri Hisab Do' | Ahead of Lok Sabha poll in the state, the Trinamool Congress on Friday launched a web series christened 'Pradhan Mantri Hisab Do' comparing various welfare schemes of the Narendra Modi government at the Centre with that of the TMC government in West Bengal. The first episode of the web series began with a short film comparing two schemes Bengal governments Sabooj Sathi and the Central governments Beti Bachao Beti Padhao. Under the Sabooj Sathi scheme of West Bengal bicycles are given to girl students of class 9 to 12 studying in government run and government aided schools and madrashas of the state. After West Bengal Govt Denies Permission, PM to Address Siliguri Rally at New Venue | Prime Minister Narendra Modi will address the scheduled public rally here on April 3 at a ground belonging to the Railways, after the West Bengal government denied permission for the venue earlier sought by the BJP. The new venue for the prime minister's rally sits adjacent to the New Jalpaiguri Railway Station, BJP's Darjeeling district president Avijit Roy Chowdhury said on Saturday. "The local administration did not give permission for the venue we had earlier selected. Then, we looked for another ground and got permission for it," BJP state president Dilip Ghosh said. "It is necessary for you (people) to know about your prospective MP. How did I win elections from Pilibhit? Every person knows that whenever anyone had sought some help, the person has not returned empty-handed," Maneka Gandhi said. Maneka Gandhi will fight from Sultanpur, a seat represented by her son, Varun Gandhi, who will contest from Pilibhit in the Lok Sabha election. Maneka Gandhi Starts Campaigning in Sultanpur | Union minister and BJP leader Maneka Gandhi began her campaign from the Sultanpur constituency of Uttar Pradesh on Saturday. Maneka Gandhi said she started her political journey from here along with her husband, Sanjay Gandhi. "When I lost my husband, my son was 100 days old. At that time, I had felt lonely and had left everything to God. And today, when I see an army of party workers and the enthusiasm in them, it seems that we will win the polls," Maneka Gandhi said at a party workers programme in Sultanpur. Union Minister Arun Jaitley tweets, "The Bengaluru case is a text book method of the UPA on 2 fronts : use Government money, round trip it through Contractors & beneficiaries to enrich themselves & then lip sympathy for federalism destroying it whenever the opportunity arises. This is a very transparent self goal." Aligarh DM Submits Evidence to EC on Rajasthan Guv's Remarks on Return of Modi as PM | The Aligarh district magistrate has submitted "evidence" to the Election Commission regarding Rajasthan Governor Kalyan Singh's reported remarks supporting the return of Narendra Modi as prime minister, sources said. The EC is examining his reported remarks in the light of possible violation of the Model Code of Conduct, as holding a constitutional post makes the governor "apolitical". The sources said details and clip of the comments were submitted to the Uttar Pradesh chief electoral officer Friday. Cong Warns its Workers of Disciplinary Action if they Work Against Coalition Candidate | Wary of dissidence within hampering the prospects of the ruling Congress-JD(S) alliance in Karnataka, Congress has warned its workers of 'strong disciplinary action' if they work against the coalition candidate in the Lok Sabha polls. With transfer of votes between Congress and JD(S) crucial for them to outperform the BJP, there is a worry in both parties that dissidence may affect their performance. Both parties that had fought bitterly against each other ahead of the May 2018 assembly polls, joined hands to form an alliance as the election threw up a hung verdict. More than Rs 19 crore of unaccounted cash has been seized in Telangana during the enforcement of model code of conduct for the Lok Sabha elections that came into effect from March 10. As on Saturday, Rs 19.03 crore has been seized, an official release said. The worth of liquor seized was Rs 2.86 crore, and narcotics worth Rs 2.48 crore also has been captured. In a series of tweets, Chief Minister N Chandrababu Naidu responded to PM Narendra Modi after he termed Naidu as ‘U-turn Babu’ and alleged that he quit NDA last year because he was unable to account for his administration's spending of central funds. You are not Chowkidar, you are Bakhidar. You have not fulfilled the promises of special status, railway zone, metro rail, Kadapa steel plant. Is it not your conspiracy against AP? Do you consider Andhra Pradesh a part of India? Why this discrimination against us? Why have you shown this kind of negligence towards five-year-old Navyadhra Pradesh? Is this democracy or monarchy? How’d we deter any terrorist if they know that prosecutors are unlikely to do their job properly? 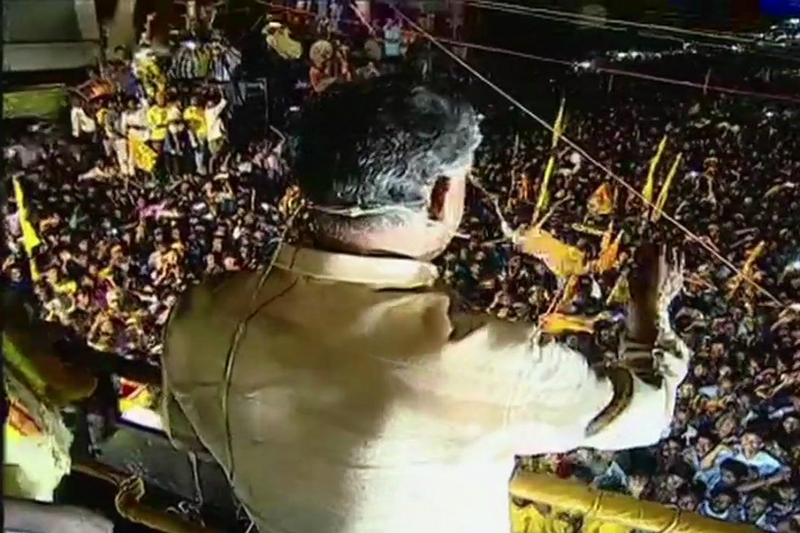 Andhra Pradesh Chief Minister and Telugu Desam Party leader N Chandrababu Naidu holds a public rally in Rajam, in Srikakulam district. Issue Ads for Indore & Bhopal Seats, CM Kamal Nath Taunts BJP | Madhya Pradesh Chief Minister Kamal Nath Saturday taunted the BJP for the delay in announcing candidates for the Indore and Bhopal Lok Sabha seats, both considered strongholds of the saffron party. He said the BJP should issue advertisements inviting suitable candidates for the two seats. Senior leader and former chief minister Digvijaya Singh is the Congress' nominee from Bhopal while the BJP is yet to announce its candidate. The seat has been held by the BJP since 1989 and the 2014 polls was won by Alok Sanjar who defeated the Congress' PC Sharma by a margin of over 3.70 lakh votes. Congress' Rajya Sabha MP and SC lawyer Vivek Tankha likely to contest from Jabalpur. He was also the first lawyer from Madhya Pradesh to have been appointed Additional Solicitor General of India. He had played a major role in resolving disputes between Madhya Pradesh and Chhattisgarh after the latter was created in November 2000. Tankha has been representing the Whistle blower in Vypam Scam Case of Madhya Pradesh. Election commission asks Mizoram government to hold notification of liquor prohibition law till poll process is over. After Nishad Party Quits Alliance, SP Fields New Candidate in Gorakhpur | A day after the Nishad Party quit the SP-BSP-RLD alliance in Uttar Pradesh, the Samajwadi Party Saturday named its own candidate for the prestigious Gorakhpur Lok Sabha seat, dropping sitting MP Pravin Nishad. Ram Bhuwal Nishad, the SP candidate from Gorakhpur, the seat once held by Uttar Pradesh Chief Minister Yogi Adityanath, is also from the Nishad community. The Nishad party is headed by Sanjay Nishad, father of Pravin Nishad who had won the Gorakhpur parliamentary seat on an SP ticket in the 2018 bypolls. Gorakhpur was considered a bastion of Adityanath, who had represented the parliamentary constituency several times before. 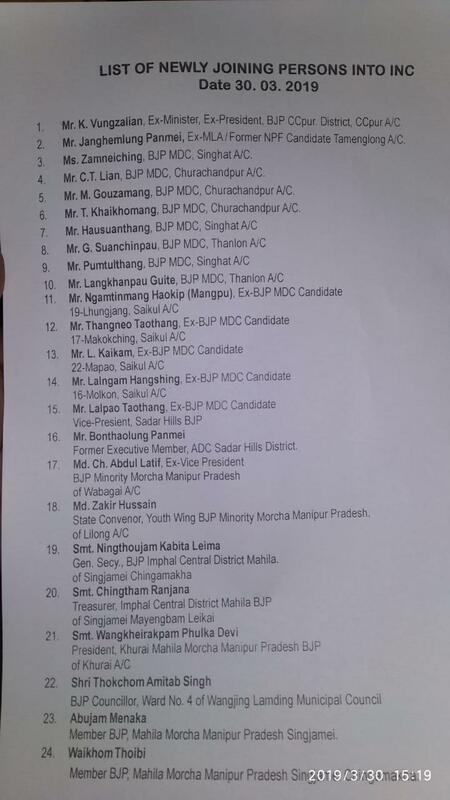 24 BJP members in Manipur joined Cong Today | Twenty-four BJP members from various districts of Manipur including a former minister and former BJP president of Churachandpur District, K Vungzalian and former MLA and NPF candidate, Janghemlung Panmei joined Congress today. NCP leader Ajit Pawar slammed Shiv Sena president Uddhav Thackeray who was present when BJP chief Amit Shah filed his nomination, reminding the Sena and BJP of the insults they had traded earlier. Thackeray accompanied Shah as he filed papers for the Gandhinagar Lok Sabha constituency, and also shared the dais with him at a rally. "There can not be turncoat tigers..." Pawar tweeted. The big cat is the Sena's logo. "Seeking votes in the name of Chhatrapati Shivaji Maharaj amounts to insulting the warrior king's glorious legacy," the NCP leader added. The Congress-led UDF's second biggest ally in Kerala, the Indian Union Muslim League, has asked the Congress high command to decide quickly on whether Rahul Gandhi will contest from Wayanad. Gandhi has earlier expressed interest in contesting from two seats, calling the primary constituency of Amethi his "karmabhoomi". At a rally in Arunachal Pradesh earlier in the day, Modi urged the people to vote for a 'chowkidaar' who would provide security to the country. Modi also claimed that Opposition parties were "disheartened" by India's growth and success. Kicking off his campaign here for simultaneous Lok Sabha and Assembly polls in Arunachal, the prime minister said the state is a "shield for the country with the people zealously guarding the border as sentinels". BJP chief Amit Shah filed his nomination papers today from LK Advani's Gandhinagar. He was accompanied by Union ministers Rajnath Singh, Arun Jaitley and Shiv Sena president Uddhav Thackeray. Internal dissent has erupted in Maharashtra Congress after Ashok Chavan's nomination from Nanded Lok Sabha seat. Sources said that voices to field another working president is gaining ground within. Many have already questioned Chavan's leadership. Considering the situation, top brass in Delhi has rushed a three-member team, including KC Venugopal, to Mumbai to hold talks with Ashok Chavan, Prithviraj Chavan and Sushilkumar Shinde. Bhim Army chief Chandrashekhar Azad will hold a roadshow in Prime Minister Narendra Modi's parliamentary constituency, Varanasi, today. The outfit founder has been granted permission for the same district administration. Meanwhile, PM Modi will hold two rallies in Assam and BJP chief Amit Shah will file his nomination from Gandhinagar. District Election Officer and District Magistrate Surendra Singh said that Azad has been given "conditional permission" to hold roadshow. According to the conditions, loudspeakers cannot be used during the programme. Permission has been given for a car, nine bikes and 500 people. Stops near school and religious places are prohibited. Apart from this, the model code of conduct must also be fully complied with. Union ministers Rajnath Singh and Nitin Gadkari and leaders of BJP's allies such as Shiv Sena chief Uddhav Thackeray, SAD supremo Parkash Singh Badal and LJP founder Ram Vilas Paswan will be present during party president Amit Shah's filing of nomination from Gandhinagar Lok Sabha seat on Saturday. The presence of the top BJP-led NDA brass at the event is being seen by observers as a show of support for Shah and an acknowledgement of him being the second most powerful leader in the alliance after Prime Minister Narendra Modi. Shah is replacing BJP veteran L K Advani, who had been winning uninterrupted from Gandhinagar since 1998, from the prestigious constituency. Leaders of BJP's allies and Union ministers, including Rajnath Singh and Nitin Gadkari, are scheduled to accompany Shah during filing of his nomination papers, BJP's Gujarat unit president Jitu Vaghani said on Friday. All these leaders are likely to accompany him in a road-show in Ahmedabad on Saturday, before filing of the nomination. Sharing the details about the event, Vaghani said the four-km road-show would start from Sardar Patel Statue in the Naranpura area of Ahmedabad and will culminate at Patidar Chowk in the Ghatlodia area. Party workers would greet Shah by forming a human chain on the road in Gandhinagar, he said. "Shah would also address people before starting his road-show in the presence of our two union ministers and NDA leaders Badal and Thackeray. Shah may land in Gujarat tonight and the road-show would begin at 9 am tomorrow," Vaghani said. From Patidar Chowk, Shah would head to Gandhinagar in his car to file his nomination papers. Shah, who was elected to the Rajya Sabha from Gujarat, has been nominated by the BJP for the Gandhinagar Lok Sabha seat. Last date for filing nominations is April 4. Polling for all the 26 seats of Gujarat will take place on April 23.